Founded in 1988 the House Rabbit Society (HRS) is the largest rabbit rescue and advocacy organization in the world. Since its founding, HRS has expanded to form a network of thousands of members and hundreds of licensed volunteers across the United States, Canada, Australia, Europe, and Asia. To celebrate its 20th anniversary, House Rabbit Society chapters will be holding special events around the country throughout the year, and we will be selling commemorative items as well. On June 21st they will be holding a Celebratory Dinner at HRS Headquarters called "Leap for Joy", which will be fully catered and feature a range of events including an auction for "wonderful toys, housing and treats for your rabbit, as well as great rabbit-themed goodies". After incorporating as a nonprofit in 1988, HRS began publishing the House Rabbit Journal, which led to volunteers emerging first locally, in the San Francisco Bay area, and then from other areas of the country. These volunteers established the first chapters of House Rabbit Society. Today, the organization is responsible for educating tens of thousands of people, including present and prospective rabbit caretakers, veterinary and shelter staff workers, members of other rescue organizations, and members of the general public. In 2000, HRS opened the first public rabbit-only shelter in the country, in Richmond, California, which serves as a model for animal shelters around the world. 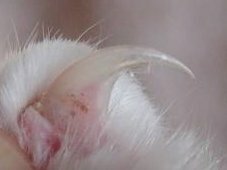 Jun 29, 2017 admin Comments Off on Declawing Cats: Risky Procedure or Simple Manicure?